We have installed and activated the Dokan Store Vacation Plugin. The Vacation settings do appear on the Seller Dashboard, however the Vacation settings do not save. When you Enable a Vacation and Saving settings, you do see an confirmation message that the settings save, but the settings do not show if you refresh the page. We have tested this with all plugins disabled, except Dokan plugins and Woocoomerce, using a the Twenty Fifteen default theme. How can this be fixed? We will provide login information via the form. I have received your site details. Please allow me some time to check. I have checked your site, but seller settings were updated correctly and after refreshing the page it saves all data. Please provide screenshot here and also provide your admin details. I am not able to access your admin panel. See the below screenshots. After saving, it does show the confirmation message, but if you reload the page, the vacation settings have disappeared. We have updated permissions to admin access. We have tested it with a Seller and the Vacation settings are still not saving. Please provide your FTP details. FTP information has been submitted via the form. Now you can check your site. Please let me know the update. 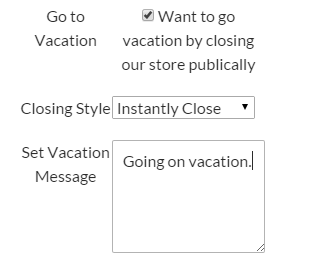 The topic ‘Dokan Store Vacation Settings Not Saving’ is closed to new replies.